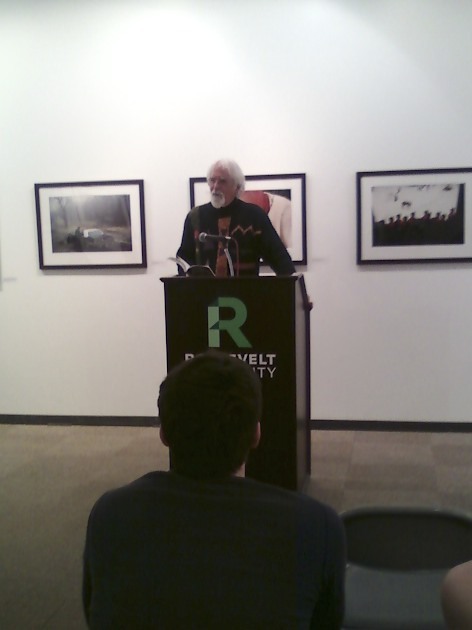 In his second visit to Roosevelt University, Canadian poet Gary Geddes was the star attraction of a public reading at the Gage Gallery on April 2. Geddes has written prolifically and received accolades such as the British Columbia Lieutenant Governor’s Award for Literary Excellence in 2008. In an interview with the Torch, Geddes said that his career as a poet and a writer was somewhat behind his career as an editor and professor. He said it’s not a regret for him, however. “I had the time to learn a lot of things,” Geddes said. He pursued his doctoral studies, taught at numerous Canadian universities and edited a collection of Canadian poetry. Geddes called the anthology “a great piece of luck.” He was inspired to create the anthology after being frustrated by the lack of an up-to-date collection of Canadian poetry. Even though he had no editing experience he said he, “flew by the seat of the seat of [his] pants,” and the anthology was published in 1969. Geddes explained that his work often focuses on current politics, historical moments and social issues. Even though he writes about such seemingly expansive topics, he is not distant from his subject matter. Two weeks before 9/11, Geddes spent time in Afghanistan on a Taliban visa interviewing refugees for his nonfiction book “Kingdom of 10,000 Things.” Four years ago, he was in Africa interviewing victims of trauma. “I wanted to know how they survive their traumas, how they heal themselves, and what their notions are of justice and how power is exercised and abused,” he said of his trip. He also spoke positively about his time in Chicago. Geddes read from his poetry collection, “What Does a House Want?” He also read some personal poetry about his mother. His poem, “Sandra Lee Scheuer,” was a particularly powerful piece about a victim of the Kent State Massacre. During the reading, Geddes mentioned that coming back from his work with trauma victims in Africa make him feel like he had secondary PTSD. One attendee inquired during the Q&A about what kind of toll it might take on Geddes to engage intimately with other people’s trauma and difficult experiences. “What would my life be like if I didn’t write about these things?” he answered. “I don’t think about the costs, really. I think about the privilege and being able to share it with people like you.” Audience feedback after the reading was positive. Christian TeBordo, director of the MFA Creative Writing Program, commented on why Geddes was a good candidate to read at the university.